I'm happy for you Sandi. What a wonderful feeling this must be for you. I came across your blog and I must say you have done a great work. The posts are quite interesting so I bookmarked your blog right away. 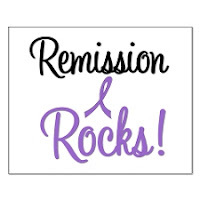 Congratulations on your remission! YEA! What an incredible milestone to be reaching. Kudos to your strength and courage.